Thermal Labels require a heat source in order to effectively attach to your product. We don’t use the word attach lightly either – with our thermal labels, the adhesiveness released when heat is applied is incredible. However, it is vital to know the difference between two main types of thermal labels. Direct Thermal Labels are made from paper that is heat sensitive. A printer head from a thermal printer will image the specific information onto the label as the label passes through the machine. These labels are perfect for an on demand printing situation or when each label has variable information or dynamic (changing bar codes) They are most frequently seen on deli scales where each weight and price is different. We can supply blank white labels or for a higher end look we can pre-print your company logo in multi color and supply these labels to you where you may then print the variable information on them. 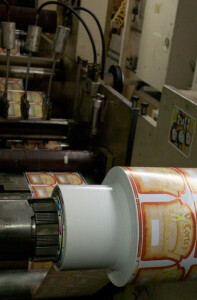 Thermal Transfer Labels do require ribbon to be used in their printing process. They are typically used in the same applications as direct thermal labels however the use of ribbons can offer more flexibility in on demand print applications. It is possible to print in multiple colors using ribbons. The thermal transfer label material is a bit less expensive than direct thermal material however the cost savings may be offset by the cost of the ribbons. Laser and inkjet labels are labels die cut into sheets designed for use in desktop or commercial laser and inkjet printers. The facestock is engineered to be receptive to the toners or inks used in these printers. These labels allow you to print on demand and variable data and in most cases can be done without the need for investment in thermal printers or expensive software. United Label has a wide offering of stock sizes for direct thermal, thermal transfer, thermal transfer ribbons and laser labels. Contact us to inquire today. On demand label printing can be the most optimal and economic solution to your labeling requirements. We can offer advice and the best option should you decide to use one of these technologies to your advantage. Ask us for assistance. We’re always here to help you find the perfect label for your company’s product.